— May Baskets Are Not a Thing in Massachusetts. Why? One of my best friends from Boston College greeted me with "happy May" over gchat this morning. It sparked a memory of making May baskets with my Grandma as a young girl. My friend, Brigid, grew up in Minnesota, and when I shared the thought with her she immediately knew what I was talking about. It's a tragedy that our cubicles are 450 miles apart, or I would have most certainly carried on the tradition. 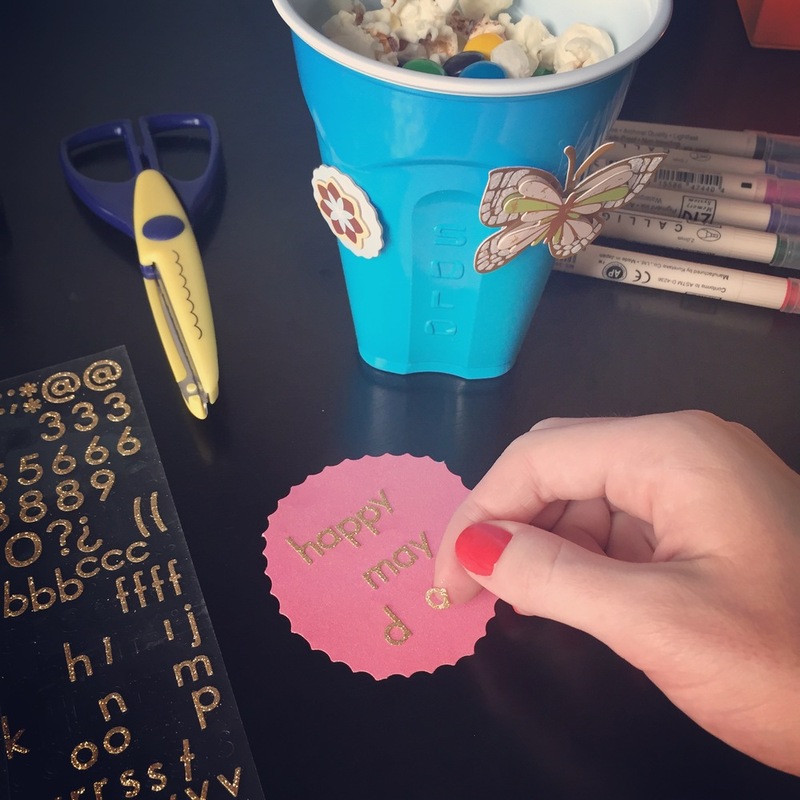 May Day is celebrated May 1st, and includes the giving of small (homemade) baskets of sweets or flowers, usually left anonymously on neighbors' doorsteps. My friend from California has joked that the Midwest is the last to know about everything. It would appear his statement is accurate, as this tradition seems to have faded out over the past few decades. Haters gonna hate. Anyway, Brigid reminded her sister of the fun, and when Ellen approached her co-workers about the giving of May Baskets they looked, "at me as though I had sprouted antlers." Clearly, things were getting serious. Ellen took it into her own hands to fully explain the holiday. #sassycat. Her lovely article, "May Baskets Are Not a Thing in Massachusetts. Why?" is posted on Boston.com, and definitely worth the read for you May Basket newbies. Similar to a Valentine, there is no right or wrong way to make a basket. My signature was popcorn and M&Ms, and after (expertly) decorating the paper cups it was time for delivery. Oh! How could I forget to mention the BEST part of this whole shenanigan?! May Baskets are the only acceptable - and polite - occasion to ding dong ditch. Yep, now you are jealous. How does it feel to know you not only missed out on delicious snacks, but also, the opportunity to spend an entire afternoon ding dong ditching and not hearing one nasty word about it?! Must be sad. Those were the good days, and after talking with Brigid I thought about bringing back the tradition this afternoon. In fact, I did make my signature May Basket to show all of you my amazing talents! However, instead of delivering it to my (I think he's cute) neighbor I ate it while FaceTiming with MOTS. Sorry I'm not sorry.